Seventeen-year-old Justine Blanchet is living a life that many dream of, but few ever realize. The rising country sensation, and Québec native, performed late last year at the Moonshine Café in Oakville, Ontario. The establishment provides a relaxed, supportive atmosphere that is ideal for new artists and advanced performers alike. Blanchet has also appeared on Global News for her music. I caught up with the budding artist after she completed a songwriting session with fellow songwriter Carrie DeMaeyer in Burlington, Ontario. Blanchet began singing opera as a child, but found the country genre suited her best. Her music has a fresh beat that reminds listeners of what it means to be young and carefree. For Justine, the ability to pursue her music comes on the heels of her educational upbringing. Blanchet’s mother, who holds a teaching degree in special education and a Master’s Degree in instructional design, homeschooled the young artist and supports her by traveling with her to events and acting as a manager of sorts. Justine attributes her independent work ethic to the skills she gained as a student while learning from home. Homeschooling has provided the flexibility she needs to network with others in the industry and perform, while maintaining consistency in her academics. It has also helped the singer become a more organized individual, which has been a much-needed skill in her line of work. Blanchet balances school by completing work whenever she can, even if that means in the back of the car, on her way to the next show. Blanchet is not alone. More and more parents are choosing to home educate for a variety of reasons, including the flexibility it provides. From 2006-2012 homeschooling enrollment grew an astounding 29% in Canada (The Fraser Institute). Parents can tailor their child’s education to a pace that suits their needs and eliminate electives that are of little interest. This, in turn, allows more time for the student to focus their energies on skills they have a greater aptitude for, which has been instrumental to Blanchet’s success as an artist. With online courses being the popular choice for teachers and students alike, old stigmas associated with the practice are being broken; homeschooling is hardly recognizable from what it once was. Parents hoping to home educate have access to affordable and, at times, free options, such as Google Classroom. The program delivers an online platform that is especially helpful for less organizationally inclined individuals. Parents can create class announcements, tests, and track their student’s progress in one structured and environmentally friendly format. With supports like these available, the thought of educating children from home becomes a much more feasible task. Ever aware of the importance of academics, Blanchet recently enrolled in an online program through Athabasca University. She is preparing herself for the future in the event that her singing career does not yield the results she hopes for. In a few years, Blanchet will obtain a degree in Marketing from the institution. For Justine, every day is an adventure and though the young hopeful doesn’t know where her music will take her, she’s open to exploring her options. Ultimately, for Blanchet, it’s all about the music and not about the fame that may result. “If I can put music out there and inspire people with that, then I’m happy”. Photos courtesy of Stéphanie Nantel of stephotographie. Visit stephotographie.com for more info. 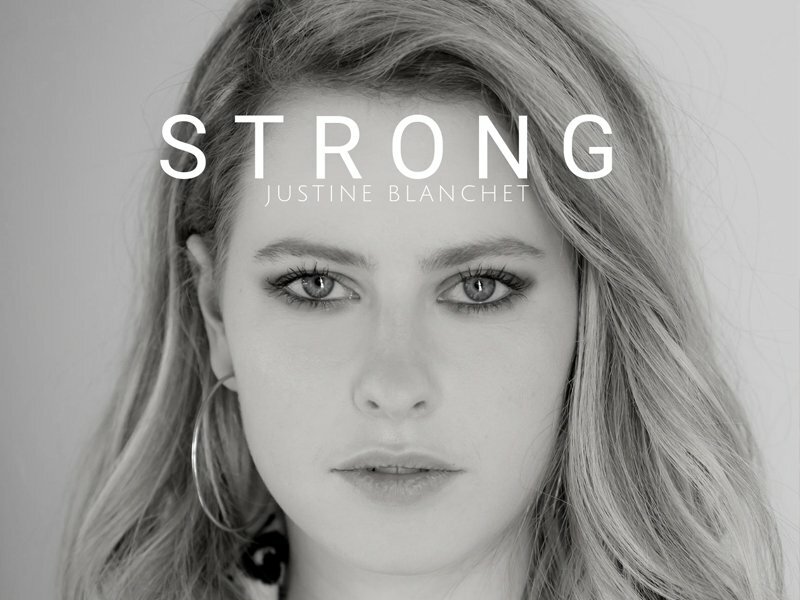 Watch for Justine’s latest single “Strong”, which will be released on January 25. You can find her music on itunes, Spotify, amazonmusic, GooglePlay, or by visiting her website at justineblanchet.com.